WTOP reports the proposal to put tolls or (more likely) HO/T lanes on the Fairfax County Parkway is dead. HO/T lanes and/or tolls on a road that isn't even a freeway doesn't make sense to me, so I'm glad it's dead. Some of it is functionally a freeway...through Fort Belvoir North and from Popes Head Rd to the US 50 ramps. Enough of it is limited-access to where you could still do HOV/HOT lanes with appropriate transitions for turn lanes. Say hello to US 74 south of Charlotte. 6-lane roadway with tight urban interchanges, connecting driveways, 50 MPH speed limit, no cross roads, and future HO/T lanes in the median. A creative way to convert a non-freeway into a free-flowing road, still allow full business access, sidewalks, and no traffic lights & cross roads, as opposed to a full freeway upgrade, relocation of every business, or numerous service roads, wide interchange footprints, etc. "similar to what NJ has been doing for decades"
Fair point. I've never really seen it built in the south though, so it's a new concept for those of us who aren't as familiar with the north. To be fair, while NJ has plenty of barrier-divided roads with jughandles, they don't have nearly as many 100% free-flowing jersey freeways like what's being proposed for US 74. NJ 17 between US 46 and I-287, NJ 208 and NJ 4 between I-287 and I-95/NJTP, and US 46 and NJ 3 between I-80/NJ 23 and NJ 495 are the only examples that come to mind. I'm sure there's more that I'm just forgetting, but simple jughandle-laden divided highways are far more common. That response would be more fitting if sprjus4 were acting as though NC had just invented the jughandle. I thought it was an article quote, so I was responding to WTOP. Anyway yes, there are others: US 1 in parts north of Trenton, US 9 south of the 1 split, US 22 east of the last traffic light, US 30 west of US 130... there are others of course. I believe the point that WillWeaverRVA was conveying is that, aside from tolled water-crossings, Jersey-type/non-limited-access freeways aren't tolled. The Virginia General Assembly -- where subcommittees rule. Two highway-related bills met their death in a subcommittee of the House Courts of Justice Committee -- reckless driving and license suspensions. Another bill is on shaky ground after the transportation subcommittee of the House Appropriations Committee voted 5-0 to not advance the bill that would provide funds for I-73. RICHMOND — A bill that would raise the reckless driving threshold collided with a General Assembly panel on Wednesday. The bill from Sen. David Suetterlein, R-Roanoke County, would have raised from 80 to 85 mph the threshold for reckless driving in areas of Virginia where a 70 mph limit is posted. With little discussion, a subcommittee of the House Courts of Justice Committee voted down SB 1578 on a vote of 5-1. Under Virginia’s driving laws, reckless driving is 20 mph over the speed limit. What Suetterlein was trying to address is more of an issue on the interstates, where speed limits may be set at 70 mph and going 11 mph over is considered a reckless driving offense. If a police officer clocks a driver going over 80 mph in Virginia, that person faces a misdemeanor charge that can carry up to a year in jail or a $2,500 fine. Suetterlein said it’s likely the charge will get reduced, but faced with a harsh punishment, most people will pay for an attorney. The bill passed on a bipartisan vote of 35-5 in the Senate. A similar bill has passed the Senate four times in a row. It also died last year in a House committee. RICHMOND — Four Republicans voted to halt a bill with bipartisan support that would repeal current state law that suspends the Virginia driver’s license of anyone who doesn’t promptly pay court fines or costs unrelated to driving offenses. Sen. Bill Stanley, R-Franklin, estimates more than 600,000 people in Virginia currently have suspended driver’s licenses. Lawmakers on the House Courts of Justice subcommittee expressed concern about the potential impact on money collected from license reinstatement fees. Four Republicans on the House Courts of Justice subcommittee voted to kill the bill, SB 1013: Majority Leader Todd Gilbert, Shenandoah; Del. Rob Bell, Albemarle; Del. Chris Collins, Frederick; and Del. Margaret Ransone, Westmoreland. Three Democrats — Charniele Herring, Alexandria; Mike Mullin, Newport News; and Vivian Watts, Fairfax — voted against stopping the bill. RICHMOND — Sen. David Suetterlein, R-Roanoke County, is making another attempt this year at raising the reckless driving threshold, and this time he hopes the bill will go the distance. The state Senate passed his bill that would raise from 80 to 85 mph the threshold for reckless driving in areas of Virginia where a 70 mph limit is posted. SB 1578 passed on a bipartisan vote of 35-5 on Tuesday. Under Virginia’s driving laws, reckless driving is 20 mph over the speed limit. What Suetterlein is trying to address is more of an issue on the interstates, where speed limits may be set at 70 mph. So going 11 mph over is considered a reckless driving offense. If a police officer clocks a driver going over 80 mph in Virginia, that person faces a misdemeanor charge that can carry up to a year in jail or a $2,500 fine. While offenders may not get thrown behind bars, and judges will reduce the charge, drivers may hire lawyers because of the possible punishment. The bill has now passed the Senate four times in a row. It died last year in a House committee. As a general matter, I think HO/T lanes or similar on the Fairfax County Parkway probably aren't needed yet and are probably premature until they see how well certain other planned improvements work, the most notable being the planned interchange at Popes Head Road. In my experience over the years that light tends to back up traffic in both directions more than a lot of other areas of the Parkway, though I'm not entirely sure why. I do know that when there's an event at the Patriot Center over at GMU it's best to avoid the Parkway through that area because you can be delayed ten or 15 minutes trying to get through the light at Popes Head, I guess because the only two logical routes east from the Parkway to GMU are Popes Head Road to 123 and Braddock Road. Hopefully the combination of the grade-separation and the related extension of Shirley Gate Road might relieve some of that situation. Aside from there, I think rather than focusing on HO/T lanes it might make more sense first to try to replace some of the other traffic lights with grade-separated interchanges of some sort, recognizing that in some places there are space constraints and in others the volume on the other road might not merit an interchange, and in the case of the Franconia–Springfield Parkway at I-95 it would be exceedingly difficult to redesign it to eliminate the lights on the Parkway. I don't think all the at-grade intersections with smaller residential streets need to be eliminated, though I wonder whether the configuration could be altered either to RIRO in some cases or to some setup that provides acceleration space for people turning left out of the residential streets. The couple of residential streets that have at-grade intersections with the Parkway between Popes Head and Burke Centre Parkway seem like they might be candidates for redesign once the Popes Head interchange is open (and even more so if Burke Centre were to be converted to an interchange to eliminate the traffic light). Traffic goes through there fairly fast now (when there isn't a backup) and might reasonably be expected to pick up speed with the elimination of that traffic light. On the other hand, there aren't that many houses on those particular residential streets, so it's questionable how much should be spent to deal with the issue. In some other places there may not be room for an interchange but there could be an overpass, but the question would be how much of an inconvenience VDOT is willing to impose on residents in terms of leaving their neighborhoods. The light at the bottom of the hill west of the Rolling Road interchange where the Parkway meets Whitlers Creek Drive is a good example of this: There probably isn't room to build an interchange, but if there could be a grade-separation, people who live in the neighborhood north of the Parkway could use Hooes Road up the hill to Gambrill Road to exit their neighborhood. I have no idea whether VDOT would force something like that on them. I suppose the other consideration in terms of volume is that it may not make a lot of sense to eliminate some of the lights if you leave a lower-volume light right in between them (I'm thinking of if you eliminate the lights at Huntsman Boulevard and Lee Chapel Road, but you still have the light at the rec center right in between those two—the Huntsman light is a tough one anyway due to residential and commercial development directly abutting the Parkway). Based on what I've read and on the survey the county circulated, I think to some degree what Fairfax County really wants to do is to find some way to provide bus service on the Parkway once Phase II of the Silver Line opens. They want to be able to run bus service from either the Herndon/Monroe Silver Line stop, the Reston Town Center stop, and/or Reston Town Center itself down the Parkway to link to the Franconia–Springfield Metro/VRE stop to make cross-county commutes possible for people who don't want to drive but who are (understandably!) put off by the need to take the Metro all the way in to Rosslyn if you want to ride back out to Reston. That's certainly a noble goal and something worth exploring, but the big challenge is what the buses would serve between the Silver Line corridor and Springfield. There are a couple of slug lots that are easy to reach from the Parkway that could serve as bus stops, but in general, the Parkway corridor doesn't have the density that you need to make regular bus service practical (unless instead the goal is to have a next-to-no-stop "super-express" type service—similar to the old JFK Express or the short-lived NX subway service in New York—but who knows how much demand there would be for that). The Burke VRE stop is not especially close to the Fairfax County Parkway. It's up Roberts Parkway near where the at-grade railroad crossing and the Guinea Road roundabout used to be. A bus would either go up Roberts Parkway to the VRE or would use a combination of Roberts and Burke Centre Parkways. Setting that aside, it seems unlikely the bus service would generate enough business to justify the expense of the dedicated bus lanes on the Fairfax County Parkway that would probably be necessary to make longer-distance bus service work there, so no doubt that's why the county and VDOT were exploring the option of HO/T lanes as a way of paying for something buses could use to bypass traffic. $3.3 billion contract awarded to Hampton Roads Connector Partners for the Interstate 64 Hampton Roads Bridge Tunnel expansion. Project completion date is November 1, 2025, about 2 years later than originally projected. "NORFOLK—Governor Ralph Northam today announced that the Commonwealth of Virginia has selected Hampton Roads Connector Partners, a design-build team, to deliver the Hampton Roads Bridge-Tunnel (HRBT) Expansion Project. The fixed price ($3.3 billion) and fixed completion date (November 1, 2025) contract is expected to be executed in April 2019. Additional information is available on www.hrbtexpansion.org." This project will add two new two-lane tunnels. It will widen the four-lane sections of Interstate 64 in Hampton between Settlers Landing Road and the Phoebus shoreline, as well as the four-lane section of I-64 in Norfolk between the Willoughby shoreline and the I-564 interchange. Don't see details of exactly what will be done with the existing tunnels and marine bridges. There will be a project briefing at the CTB meeting on Tuesday. My best bet is that they will be retained for cost purposes. Replace the existing bridges with two 4-lane bridges, retain the existing tunnels, and construct one 4-lane tunnel. Unless one 4-lane tunnel is drastically more expensive than 2 two-lane tunnels, I see no reason why not. Let's say in the future, they choose to have 3 GP / 1 HO/T lane. With one 4-lane tunnel, they can maneuver which lanes are managed, which are not, etc. The current 2 two-lane tunnels restrict it to be 2 HO/T, 2 GP. In the future, if the road is widened from 6 to 8 lanes, then the remaining existing 2 tunnels can be demolished and replaced by another 4 lane tunnel, with a full end result of two 4-lane tunnels. Or better, retain the existing tunnels as well for that future 8-lane project, have 8 GP (two 4-lane tunnels) lanes + 2 HO/T (existing tunnels) lanes in each direction. Seems better when thinking ahead 20 - 30 years. One 4-lane tunnel is drastically more expensive than 2 two-lane tunnels. See the Fort McHenry Tunnel. Wasn't one 3-lane tunnel initially proposed for this? It was found that two 2-lane tunnels could be built for the same cost. And an additional lane would cost way more? Isn't 4-lanes being built in the end result either way, just over two tunnels? In my mind, under one roof would be cheaper, but there must be I'm missing. 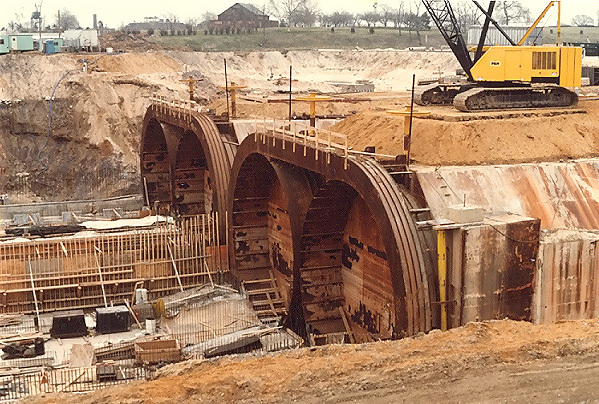 A 2-lane tunnel has a square or round cross-section that is more suited to resisting the underground pressures. A 4-lane tunnel would have a rectangular or elliptical cross-section that would require far more concrete and steel than two 2-lane tunnels. That is how the engineers at the Fort McHenry Tunnel project explained it. Wasn't I-664 built as one structure technically, just with a wall in between the two? I can't find a good photo of it, but this is a similar design. Circular cross-section steel vessel with a steel "jacket" around that that thousands of tons of concrete are poured into during the immersion process. That is where the tunnel element extends up onto land. Isn't that essentially what a I-64 4-lane tunnel would be? Just without the middle dividers? And what's the plan for the two 2-lane tunnels? Like this, or separated 2-lane tunnels? I know the plan is the cheapest and works out now, but it's my belief that one 4-lane tunnel will work better off in 20 - 30 years operational wise, especially if have to expand capacity later on. Like I mentioned, one solution could be 8 GP + 4 HO/T. That would involve the existing tunnels, plus a conceptional 4-lane tunnel built now, and a future 4-lane tunnel. They are two separate 2-lane tunnel elements, round in cross-section. Bored tunnels. TBMs are round in cross-section. Probably 2 separate bores. That would be fantastically expensive for little gain. The next Hampton Roads tunnel project will be to expand I-664 with two more 2-lane tubes, and to build the I-564 bridge-tunnel to I-664. No need for further HRBT expansion. When it opened, the Virginian Pilot had a terrific diagram of how the 664 tunnel was designed and built. Can't find it online though I found a reference that said the paper devoted 14 pages to it.